Talking Season 2 With The Coaches! Good stuff posted on Starpulse today. Adam Levine, Blake Shelton, Christina Aguilera, Cee Lo Green, Carson Daly and Mark Burnett were on hand to talk with me about season 2 of The Voice. 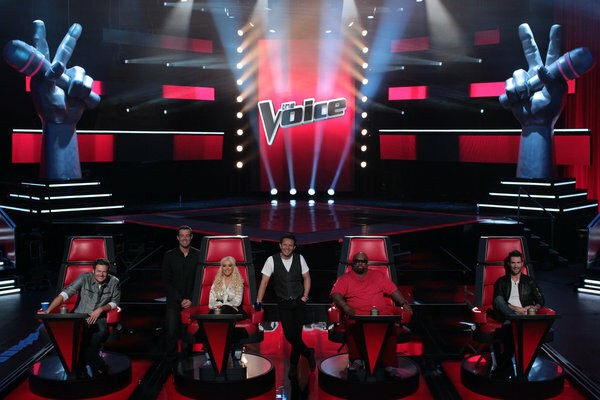 In its first season, The Voice was a surprise hit. Some say it even saved NBC’s season. It changed people’s lives. And this year, it’s got the most coveted time slot on television: following the Super Bowl. No pressure, right? Not when you’re a foursome of award-winning coaches, possibly the most recognized former MTV employee, and definitely the most well-known reality TV producer ever. Maroon 5 front man Adam Levine, Blake Shelton, Christina Aguilera, Cee Lo Green, host Carson Daly and producer Mark Burnett talked with me recently as The Voice wrapped filming its blind auditions. They’ve paid attention to the show’s freshman run, and made changes for its second time around. The most notable is that each coach will have twelve artists on their team, up four from last year’s eight and increasing the overall field to 48 vying to be named ‘The Voice.’ Accordingly, blind auditions and battle rounds will be extended. Behind the scenes, recording artist Christina Milian is the new social media correspondent for season 2, replacing Alison Haislip. The changes aren’t unexpected. The plum premiere date clearly shows that the network is banking on The Voice‘s continued success, and the show’s creative team is adapting to a new challenge. “It’s a privelege to follow the Super Bowl. It’s really important to us,” said Burnett, who added that the show’s “iconic” red chairs have become so popular they’ve had to make extras. The coaches have raised their standards. They’re fully cognizant of the level of talent that’s out there after being wowed by the likes of Javier Colon in season one. Now they’re out to find better, even if they have to improve their game as well. They’ll definitely have to fight, because while last season was a surprise for all involved, this season’s artists have the benefit of other people’s experience. What hasn’t changed is what matters most about The Voice: its heart. “We’re not interested in making people feel bad about themselves,” added Levine. “As it was going down last year, I kept thinking to myself, ‘I wonder if this is going to come across as fun and exciting as it’s happening here.’ And it was,” said Shelton. Then there’s Levine, who quipped that he hopes “everyone drinks a lot of beer while they’re watching the Super Bowl.” Yes, the show’s sense of humor is still intact, too. And why not? These people have nothing to fear. The Voice returns February 5, 2012 on NBC. Feeling the team spirit, I wore my Team Adam T-shirt to the press junket. Adam didn’t see it, despite another three or four people telling me he should, but Blake did – and he was amused. I believe, though can’t tell, that Mark Burnett noticed it too – at least he looked at me, then turned and said something to Adam. All in all, I was amused. Mark Burnett and I had met previously (at this year’s TCA Emmys panel), and I was floored that he recognized me. He walked by me on the way out and thanked me for coming. Considering I only talked to him about The Voice for a minute or two a few months ago, that guy has a great memory. Yes, I got to sit in a big red chair. Yes, it is as awesome as you think it is. ← Happy “The Voice” Halloween!